Dereverberation using spectral subtraction removes reverberant speech energy by cancelling the energy of preceding phonemes in the current frame. This energy is only an estimation, and does not offer a perfect reconstruction, but does indeed remove the effect of reverberation. Reverberation occurs when a microphone picks up multiple attenuated and delayed copies of a single signal. In speech communications applications, these copies are generated when sound reflects off surfaces in an environment. Attenuation occurs due to the surfaces absorbing some of the sound energy. Generally, these reflections are divided into two groups: Early Reflections and Late Reflections, as opposed to the Direct Sound. The temporal masking properties of the human ear cause the early reflections to actually reinforce the direct sound, and thus we are mostly concerned with the effects of the late reflections. We perceive these signal reflections as adding color to the original speech sound, and introducing an echo. More specifically, reverberation tends to spread speech energy over time. This time-energy spreading has two distinct yet equally important effects. First, the energy in individual phonemes become more spread out in time. As a result, plosives have a markedly delayed onset and decay, and fricatives are smoothed. Secondly, preceding phonemes blur into the current ones. When a vowel precedes a consonant, this effect is most apparent. Both effects reduce speech intelligibility by reducing the information available for phonemic identification. It should be noted that these observations form the basis of the dereverbation technique discussed in this article. Where RT60 is the reverberation time of the room. If reverberation is thought of as the output of a linear system with the response expressed as the room transfer function, then dereverberation can theoretically be achieved by deconvolution. Unfortunately, it is almost always the case that this impulse response transfer function is unknown, and thus we can either attempt to estimate the room impulse response or find another means of removing reverberation. Here we will consider implementing a well known approach, Spectral Subtraction, for removing noise from speech. While this is certainly instructive of the type of manipulations that we will need to do, this implementation can certainly be improved. The most obvious improvement would be to prevent the negative values possible from the subtraction in (4). Next, we could take additive noise into account. Finally, we may be able to incorporate more information to achieve better reverberant energy estimation. These improvements will be discussed later. 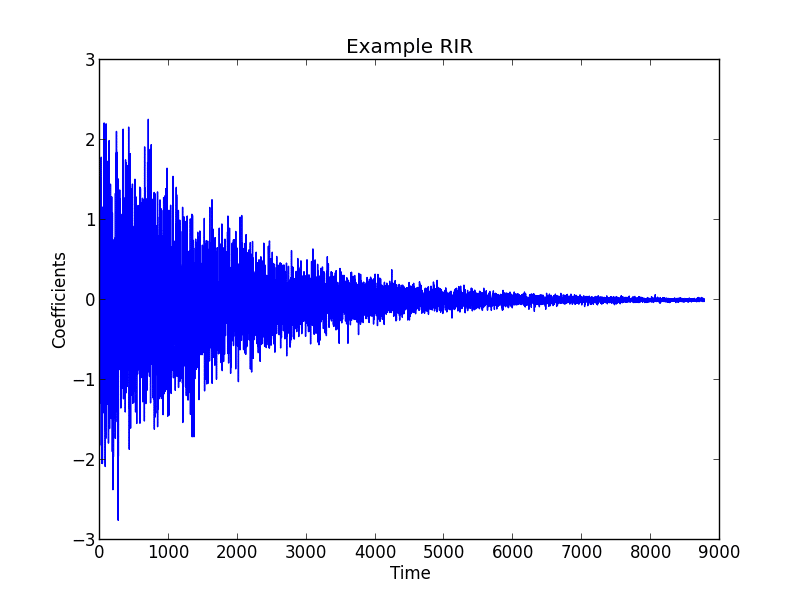 For now, we will focus on estimating the reverberation time. From frame to frame, it is likely that this estimate of a will change. Therefore, we need a way to pick the best estimate of the per frame estimates. To do this, we note that sound decay cannot occur faster than following a period of silence. Since reverberation time is defined as sound decay in silence, we should be biased towards smaller values of a. As we accumulate these estimates, we can create a pmf and choose an estimate in the left tail with some error probability when the distribution is unimodal. Else, we select the median of the smallest distribution. When the distribution is highly multi-modal, we simply select the smallest mode. To speed up the calculation, pre-calculate all β terms, ln(aj) and ln(2π/n). Finally, ln(g[n]) can be calculated from a lookup table. This lookup can be handled in two ways, either quantize and threshold ln(g[n]) such that we will be assured the value can be found, or with no pre-manipulation when the requested value is not in the table, perform a linear interpolation between the two nearest values. Speech was recorded by one of our engineers in our reverberant conference room. Obviously, we did not have the clean speech signal available, so any result is based on the strength of the adaptability of our algorithm. 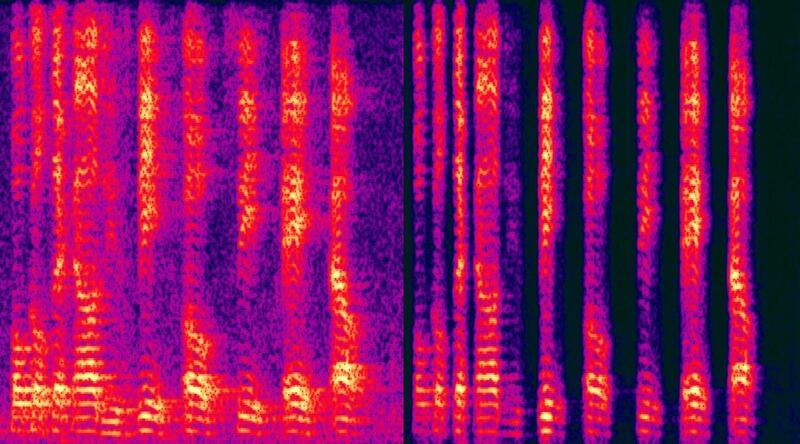 The before and after spectrograms (below) have been appended to clearly show the results of dereverberation processing. As you can see, our algorithm has greatly removed the reverberation as well as the noise. The speech comb structure is well preserved, and the speech columns have been made nearly exact. It should be noted that this result is obtained entirely with a single microphone, thereby eliminating the need for expensive hardware setups. In sum, spectral subtraction works to remove the reverberant speech energy by cancelling the energy of preceding phonemes in the current frame. This energy is only an estimation, and such does not offer a perfect reconstruction, but does indeed remove the effect of reverberation. As an online algorithm, spectral subtraction promises to be quick and effective. To improve the algorithm, aside from an optimal reverberation time estimator, we need an optimal estimate of T’, and an optimal attenuation factor λ.
 K. Lebart et al, “A New Method Based on Spectral Subtraction for Speech Dereverberation,” Acta Austica. Vol. 87, pp. 359-366, 2001. R. Ratnam et al, “Blind estimation of reverberation time”, Journal of the Acoustical Society of America. Vol. 114, No. 5, pp. 2877-2892, 2003. R. Ratnam et al, “Fast Algorithms for Blind Estimation of Reverberation Time”, IEEE Signal Processing Letters. Vol. 11, No. 6, pp. 537-540, 2004.